Entrepreneurship – you never know when it can hit you. You will never know what’s the right time to take the plunge! I guess, few things in life are just destined – for the right time, right place and right people. John Drummond had a comfortable life @ IBM. Like his dad, he also thought of retiring from IBM, leading a comfortable life. But then, destiny had other plans and Drummond got laid-off from IBM. 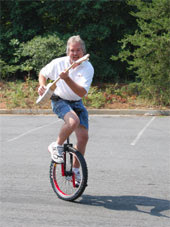 Undeterred, John turned his childhood passion for unicycles into the world’s largest retailer of unicycles. “In just eight months our little part-time business generated more income than my full-time job would have. In December, sales reached $55,000. I sent a thank-you note to my former IBM manager, telling him it was the best thing that could have happened. Read the complete article here. John’s interview with CNN here.